The Rev. 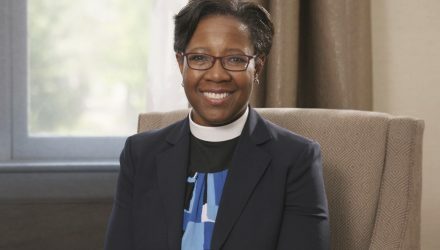 Jennifer Baskerville-Burrows ’88 has been elected bishop of the Episcopal Diocese of Indianapolis. She is the first African American woman bishop to lead a diocese in the history of the Episcopal Church. 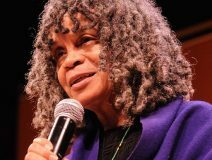 Along with performances, workshops and film screenings, award-winning writer and poet Sonia Sanchez will deliver this year's Otelia Cromwell Day keynote address at 1 p.m. on Thursday, Nov. 3, at John M. Greene Hall. See the complete schedule of events. 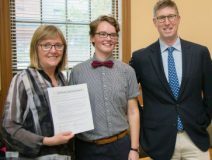 Last month, President Kathleen McCartney signed the Real Food Challenge, joining the national sustainable food initiative pledging that 20 percent of the food provided on campus will meet sustainability and fairness standards by 2020. 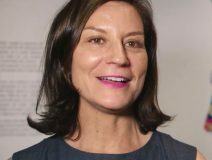 Sonnet Stanfill ’90, curator of contemporary fashion at Victoria and Albert Museum, writes in a New York Times op-ed that it’s about time for the boys' club at the world’s greatest art museums to close up shop and let in women. Emma Watson ’17 spent the summer as an editorial intern at Ms. magazine, writing about a variety of topics, including Brexit, sexual harassment, the Rio Olympics and entertainment. Check out her archive of stories. On The Sci-Tech Cafe—which features breaking news about science and technology—Smith physics professor Gary Felder talks about gravitational waves. The podcast is part of Northampton radio station WHMP's The Bill Newman Show.